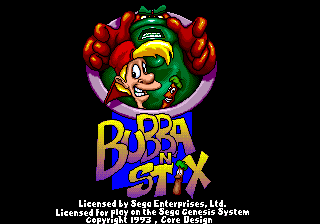 Bubba 'N' Stix is a sidescrolling action game for the Sega Mega Drive. A reportedly complete Sega Mega-CD version was planned for release in March 1994More..., but was cancelled for unknown reasons. Former developers at Core Design have confirmed its existence. Main article: Bubba 'N' Stix/Magazine articles.